I am obsessed with minimalism. That means I have made a conscious decision to surround myself with only the things I love and use on a daily basis. Having said that, I have created a cozy 'happy place' in my tiny T@B, Miles, by figuring out what I truly need. Though you don't need a lot of stuff, there are some items that RVers cannot live without. Calculating one's Needs versus Wants is an ongoing challenge but it also simplifies life, and that, my friend is the ultimate goal--simplicity. This post will be a 2 Part Series focusing on various tools by category: Cooking and Emergency Preparedness. 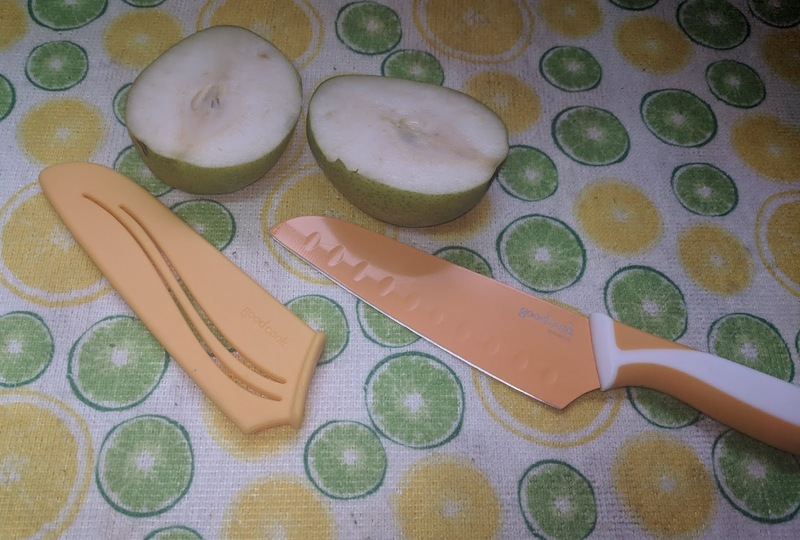 In part 1, I am sharing my favorite cooking tools and appliances. This one pot wonder has been my favorite kitchen appliance for three years and counting. It is an electric pressure cooker with slow cooker capabilities and so much more. I have cooked everything from BBQ ribs to peach cobbler in this pot. It is incredible. You can replace several pots and pans with this device as it has a saute feature that allows you to brown meat or saute veggies without transferring food from one pot to another. There are imitations out there but buyer beware. 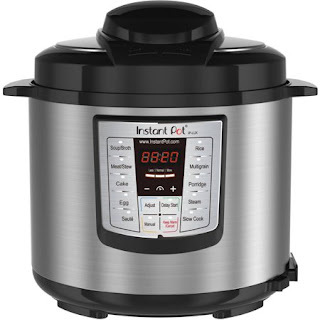 Only the Instant Pot has the stainless steel inner pot and a money back guarantee. It is even cheaper now than when I bought it and it still works like new! Whether you are traveling in an RV or not, buy one! You will find it has a cult following on social media. 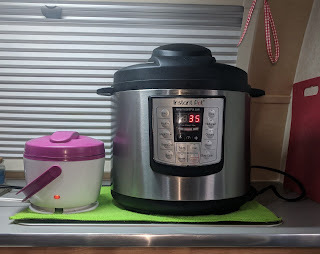 I will share some of my favorite Instant Pot recipes in future posts. The next item that gets daily use is my Faberware Nonslip Cutting Board. 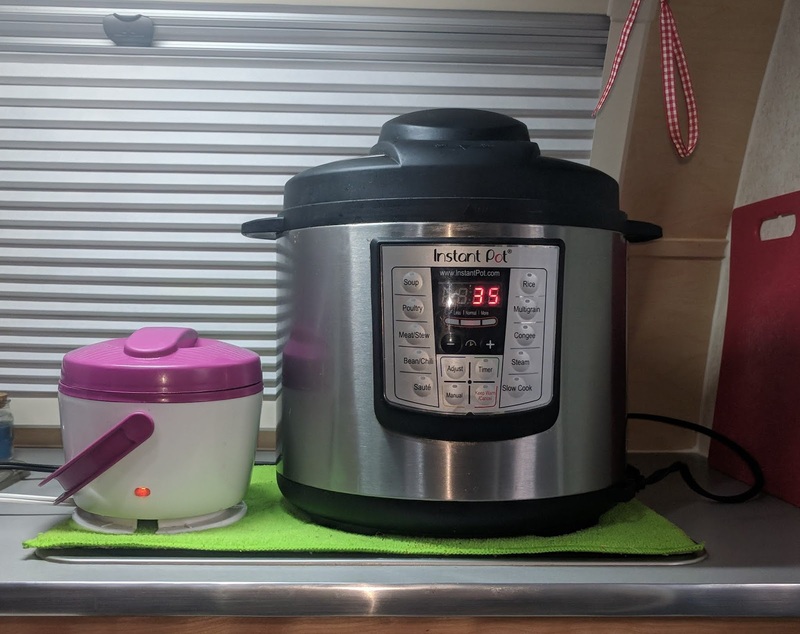 It is displayed to the right of the Instant Pot in the picture. I believe the use for this item is self-explanatory. Speaking of cutting food, I also have a great chef's knife that I use daily. It is made by Good Cook. It is a good quality knife for the price. Just be careful. I knicked my finger the first time I used it! I have had no problems with it since. I have had the knife for at least two years and I have not had to sharpen the blade. I am finding that silicone is my best friend. It is super strong, cleans well and is usually collapsible. 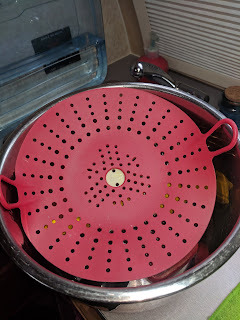 That is why I use this Vegetable Steamer basket. 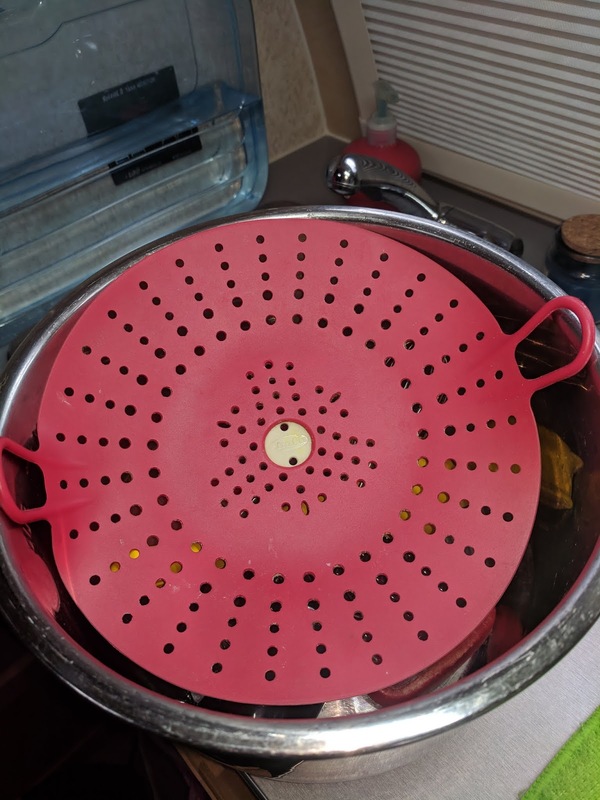 I use it in my Instant Pot to steam vegetables but it also serves as a small colander to strain vegetables and pasta. Cleaning is a snap and it holds its shape, but not the smell of the food. This little baby is also microwave friendly! Last but not least are the items that I use for my favorite beverages. Those who know me are aware of my love for coffee! 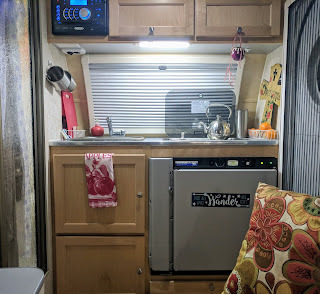 My coffee habit has evolved with the times and now that I am traveling RV style, I have learned to make my daily ritual even better. While watching YouTube, I saw Joe Russo's of "We Are The Russos" use the "pour over method" to make his favorite brew. That very day, I ordered a stainless steel pour over coffee dripper. I must say, that the coffee is smooth and tastes just like the more expensive cups you can buy at you know where. 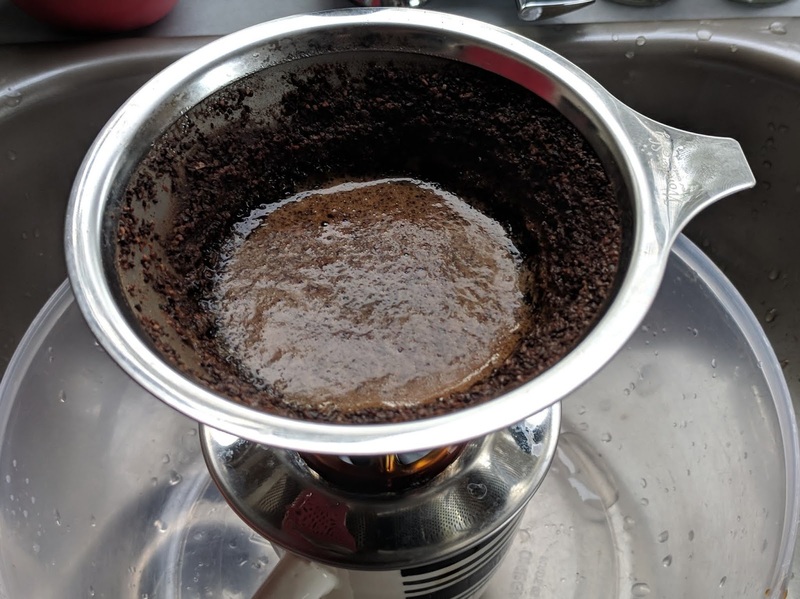 It takes a few seconds to pour the hot water over the coffee grinds but the initial aroma is worth the time and the quality of the brew is worth the effort! This will also come in handy when boondocking. Hanging on the wall are my stainless steel coffee mugs. This is for safety and also serves multi purposes. You can easily cook with these over a campfire in a pinch. I also have a set of stainless steel, stemless wine tumblers. They can also double as an extra pair of coffee or tea cups. You learn to buy unbreakable items that can serve multiple purposes. 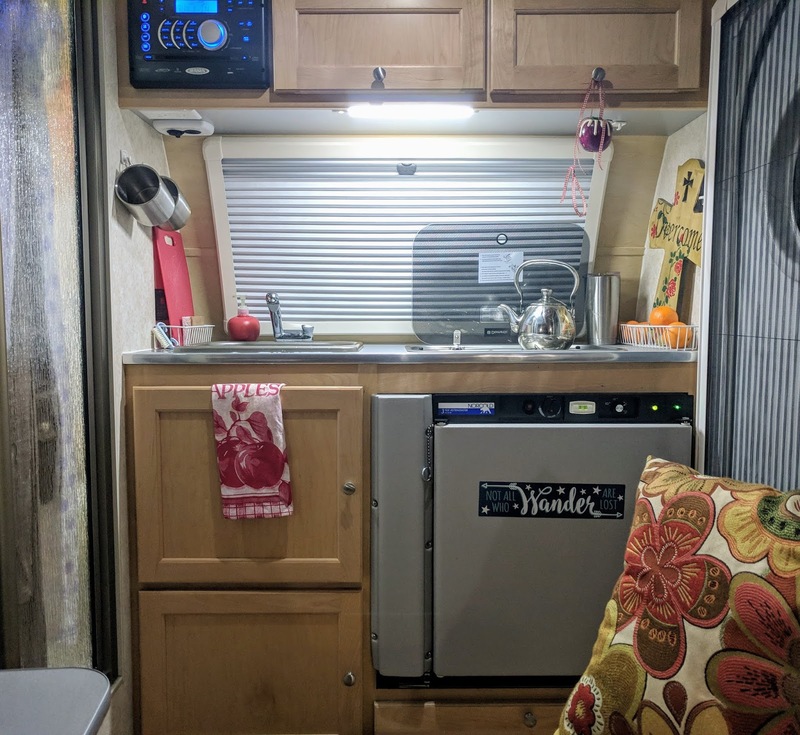 In an RV, things tend to tumble out of cabinets--a lot- especially while driving. I would put a link on here about the Baby Potobello Stainless Steel tea kettle (pictured on top of the stove), but I did not purchase that from Amazon. It was a gift from my newfound friend and stepmom, Pamela. Good luck finding them, they aredisco expensive! I have seen them on eBay. The Berkey Water Filtration System removes chlorine and bacteria. I have a bonus item in my Amazon cart that I hope to purchase soon. After researching water filtration, I have discovered that the Berkey Water Filtration System has earned a solid reputation. I must figure out where to set it up in my "luxury cabin" as I have very little counter space. It is a challenge worth undertaking. After all, access to clean water is not a luxury, it's a necessity! 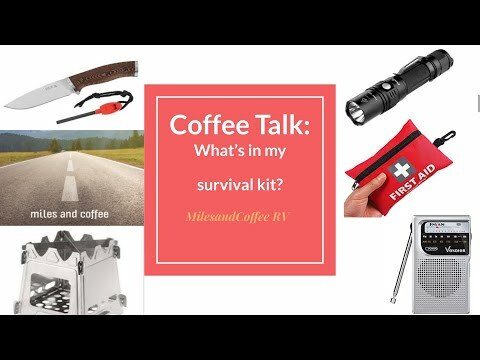 Miles and Coffee RV is a participant in the Amazon Services LLC Associates Program, an affiliate advertising program designed to provide a means for sites to earn a commission for sharing links from Amazon.com.